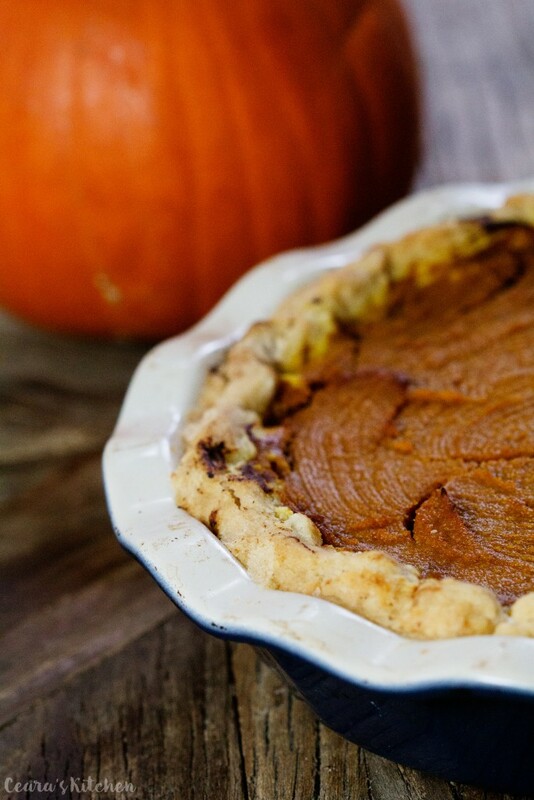 Good ol’ rustic, creamy, perfectly spiced traditional Pumpkin Pie. There’s nothing quite like it this time of year. Are you a pumpkin pie fan? This Thanksgiving weekend I wanted to make a Pumpkin Pie that was just as creamy, pudding-y, silky and flavorful as the pumpkin pie my great-grandma, mamère, used to make. And this Vegan Pumpkin Pie is just that – I served it to my (non-vegan) family for Thanksgiving yesterday and it was one of those “I can’t believe this is vegan moments” (we have a lot of those in our home, ha!). I was lucky enough to know my great-grandma mamère growing up and one of my fondest memories is making pie with her for the holidays. She was a tiny, short and strong French-Canadian woman who took pride in the pies she’d make for our family! My mamère would reminisce and talk about how she used to make seven pies a week for the family. That’s right – SEVEN. Sunday was pie making day and she’d make a different pie for every single day of the week. My mamère was very particular about her baking and I learned a lot from her baking with her when I was younger and listening to her stories in the kitchen! This Vegan Pumpkin Pie filling is honestly the perfect texture and flavor guys – based on how rich, creamy and luscious this pie is you’d never guess there wasn’t ANY cream or eggs in sight! Oh, and the filling is made from only SIX ingredients (+ salt). You can use this Vegan Pumpkin pie filling with any traditional (or your go-to) pie crust. The perfect pumpkin pie! A traditional, rustic, creamy, silky and flavorful pumpkin pie filled with a thick, creamy and flavorful pumpkin filling! Nobody will ever guess it is not made without any cream or eggs! Soak cashews for 30 minutes in hot water (or for several hours in cool water) before preparing the pie. Preheat oven to 375f/190c. In a pie pan, place the vegan pie dough in the pan (or use a store-bought pie crust). 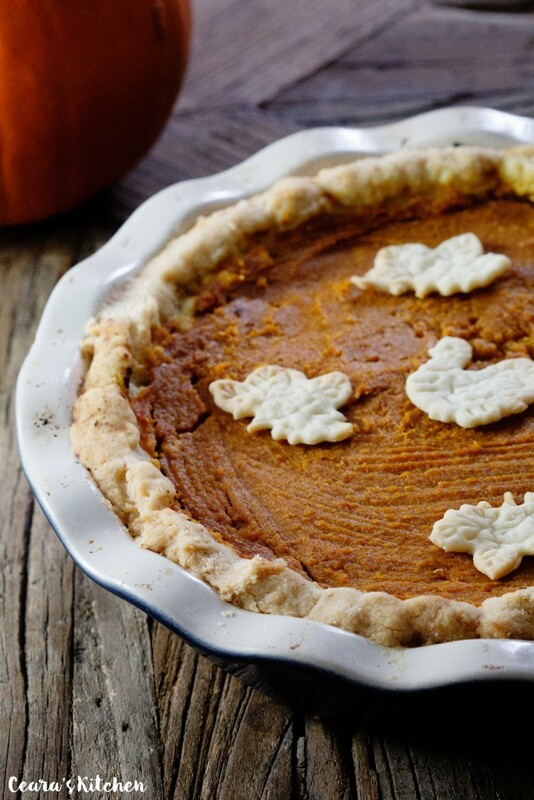 Cut out 5 leaves or Fall-inspired shapes out of your second pie crust dough using pie cutter cut-outs. Place cut-outs on a pan lined with parchment. Make the pumpkin pie filling – blend together all of the filling ingredients (pumpkin puree, soaked cashews, maple syrup, pumpkin pie spice, vanilla extract, and orange zest) until perfectly creamy. Pour the pumpkin pie filling into the unbaked pie crust. Smooth out with the back of a spatula. (Optional step for a really rustic look – brush the top of the pie with a bit of coconut or light-tasting oil. Leave this step out to keep this recipe oil-free). Bake for 45 – 55 minutes until the middle of the pie is just about set. Bake the pie cut-outs with the pie for 15 – 20 minutes until light golden brown. Check the pie every five minutes after the 45 minute mark until the pie is [i]just [/i]set in the middle. Do not overcook the pie or it will crack as it cools. Leave to cool in the pan and place pie cut-outs on top. Serve with coconut whipped cream (optional). 1) Make sure to use a gluten-free pie crust if you need this pie to be gluten-free. [br]2) I am still perfecting a healthier pie crust to use with this pie. 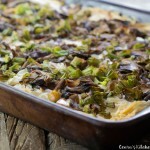 I used a traditional vegetable shortening pie crust in this recipe. 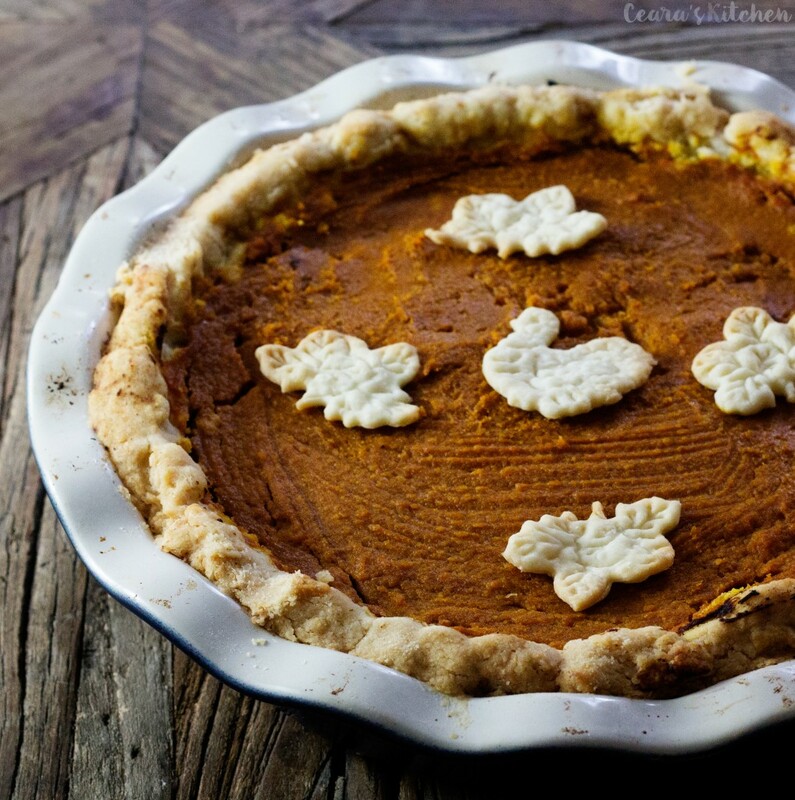 [br]3) Do not leave out the orange zest – it really brings out the pumpkin spice flavors in the pie! 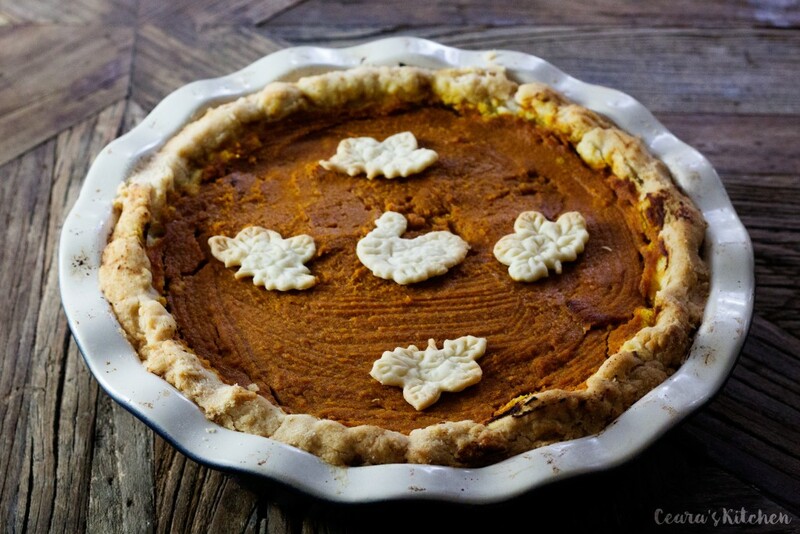 [br]4) Make sure to use pumpkin puree and NOT pumpkin pie filling in this recipe! I just made this but used walnuts instead of cashews….my blender wasn’t really working with me on mixing everything but I’m hoping it comes out as good as this one looks!!!! Hi, do you have a recipe for the pie crust?? 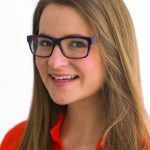 Hi Anne-Marie! I used a traditional vegetable shortening pie crust in this recipe. I’m testing out a healthier one to share soon! 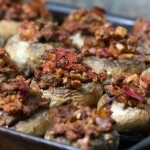 Mamère would be so proud of you and how you have turned into such a terrific and creative cook! Thank you! Let me know if you do!!! The cashews make it so incredibly creamy and rich! SEVEN pies a week?! I wish I grew up in that house!! Yum! This pie looks so lovely. I love the little hint of orange you put in there. I bet it makes it taste really fresh. Have a happy Thanksgiving! I know, right?! 🙂 I couldn’t imagine baking seven pies a week!! Thank you so much Jenn! I am with you on that one – pumpkin pie is my fave 🙂 Happy to hear you are a fan!! Thank you so much!